There’s no question of the importance of personal interactions and connections with friends as an important source of our well-being. This is especially true as we age, and much has been written about the challenge of making friends and finding love in the later years. Looking for love, or even just hoping to make a new friend, can seem intimidating when you’re older. But it doesn’t have to be that way. Personally, I didn’t find Mr. Right until late in life, and it definitely took some work on my part to be ready for the right person when he came along. 1. Re-frame old mindsets It’s all how we frame things in our minds that affect our vision. With the right mindset, it is easier to find love and friendship. Although it is often said that as we get older we get more stuck in our ways, this doesn’t have to be true. We learn more about ourselves as the years go by, and our tastes become more distinct; but that doesn’t necessarily imply that we have to become more rigid. As I’ve experienced, it is possible to become more open-minded as we age. “No!” I would emphatically answer. Being single for so long made me ready to welcome change. Having more self-knowledge made it easier to feel open to new experiences. I realized that being set in my ways was a choice and served no purpose. I made a conscious decision not to be “stuck” in a rigid mindset. 2. Don’t expect others to be perfect With age comes confidence, and hopefully, the acceptance of our own imperfections. Personally, in my younger days, I had strict standards that everyone had to live up to. My friends used to tell me that I was “too picky” regarding men, which was a nice way of saying “too critical.” Once you come to accept your own faults and imperfections, it is much easier to accept other people for who they are. Not only do I not expect anyone to be perfect, I would hate for anyone to expect that of me. 3. Don’t let others define you When we were younger, many of us chose friends a lot like ourselves. Hence the “cliques” in high school, where everyone was pretty much alike. Back then, we needed to be alike to be accepted. Once we have the self-assurance of age, it is no longer necessary to find a partner or a friend to define ourselves. You can appreciate others more fully when you realize they are not a reflection of you. Differing opinions and tastes can make things more interesting if you are open to listening without judgment. For example, the famous friendship between Supreme Court Justices Ruth Bader Ginsberg and Anthony Scalia comes to mind. 4. Embrace quirkiness Perfect is boring and quirkiness can be a lot of fun if you have a sense of humor. My husband’s “Obsessive Cleaning Disorder” would have driven me crazy in my 30s, but now I can work around it and even appreciate it. As long I keep my own modicum of neatness, I can reap the benefits of his obsession. I am perfectly happy for him to clean up the dinner dishes and organize the drawers (he does a much better job than I do). Quirkiness in ourselves and in others can make life more interesting. Don’t fight it, embrace it. 5. Celebrate differences An appreciation and tolerance of differences is a big bonus of getting older. A recent vacation was a big eye-opener. In my newly acquired travel agent role, I booked a small French river barge and filled it to capacity with 21 people. I recruited half of the passengers, whom I knew, and one of my friends brought along the others. Although mostly everyone knew at least one or two of the others on the trip, it was a fusion of childhood, college and work friends from all walks of life, white to blue collar. Everyone took a leap of faith and I held my breath, feeling responsible for the whole lot. Our group was smart to ignore the topic of politics — one that is way too divisive these days. But everyone took the time to learn from each other. We shared our love of travel, food and wine, and embraced each other’s differing backgrounds. By the time the seven-day trip ended, we all had made a few new friends. 6. Visualize Remember the self-fulfilling prophecy is just that. If you really can feel in your heart that you are ready to meet a new friend or love interest, you are much more likely to be open to it when the opportunity presents itself. Visualize it happening. I found there is a lot of value in putting good thoughts out to the universe. 7. Keep an Open Mind Keeping an open mind is key to finding new friends and love as you get older. Never say never; love and friendship could be just around the corner. Travel expert Wendy Knecht is a former flight attendant, a designer of travel bags and author of Life, Love, and a Hijacking: My Pan Am Memoir. She blogs at WendySueKnecht. The approach of Mother’s Day is a bittersweet time for many boomers like myself who don’t have our mothers around anymore. I don’t think I’m alone in saying this, but I never realized how much my mother influenced me until she was no longer here. I’ll stop myself and laugh when I find her voice reverberating in my head to “just put a little lipstick on, you’ll look so much better,” or when I see .04 seconds left on the microwave and open the door to take out the food — a signature move that drives my husband crazy, but seems to have been inherited by my sister and me. My mom, Ellie, was the mother of three children, ages 11, 15 and 18, when she and my father separated. We moved shortly afterward to The Northfield Garden Apartments in our town of West Orange, N. J., where there seemed to be a disproportionate number of single moms raising families. Most of them were divorced and some were widowed, but there was a definite sense of camaraderie among us. Those moms worked really hard. As an adult, I have a deeper appreciation for all the sacrifices they made in order to keep their families intact, sometimes having to take on the role of mother and father. For many of them, including my mother, there was a lot of pressure to make ends meet. Their time was spent selflessly working to make their kids’ lives better, with little concern for themselves. For my own mother, dating was not even on the radar, though she was an attractive woman in her mid-forties when my parents separated. ‘What You See Is What You Get’My mother taught us the value of hard work and independence. She worked two jobs as long as I can remember— mostly clerical during the week and sales on the weekend. Whatever she did, she did with zest. Although I’m sure she was tired, and albeit cranky at times, she powered through and never lost her sense of humor. I couldn’t wait to get my working papers when I was 14 so I could get an after-school job, assert my own independence and help buy my clothes. Ellie was the epitome of a “what you see is what you get” person. She wasn’t educated past high school, but she had street smarts beyond many Harvard graduates. She imparted lessons large and small on my siblings and me, and values that have given us the wherewithal to be productive and happy adults. Most importantly, we were taught to have gratitude for what we had. Ellie always appreciated the “little things,” and I remember her once going on and on about a new switchplate she bought that “changed the whole look” of our tiny kitchen. She had the ability to truly make the best of any situation. Oddly enough, I never felt envious of any of my wealthier friends who lived in nice homes with two parents. Fortunately, life got easier as time went by, and Ellie eventually remarried. But she never lost her sense of gratitude and her values never changed. 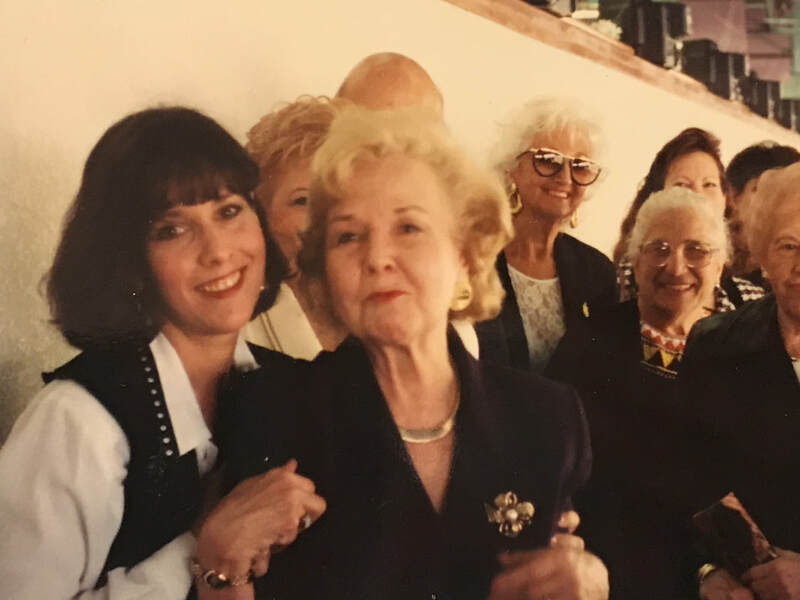 When Ellie passed away at 89, we celebrated her life as she requested, in a party fashion, with champagne and her favorite food. 1. If you’re feeling sick, take a shower and get dressed. You’ll feel much better. 2. Don’t make it a big deal. Just do it. 3. Animal prints never go out of style. 4. Something high-priced and low-cut always works. Of all the important life lessons Ellie taught me, I am truly convinced the biggest gift you can give your children is a sense of gratitude. To all those moms out there, in heaven and on earth, who sacrificed so much for us and taught us so well, thank you. Hikers greet a herd of cows while trekking across the Karwendel mountain range in the Austrian Alps. Wendy Sue Knecht This article is reprinted by permission from NextAvenue.org. Reap the benefits of health, happiness and gratitude on your next journey. Some people are just lucky — they’re born with it. I’m not talking about good looks or money. I’m talking about wanderlust …. that something inside of you that just makes you want to go places, explore and of course, wander. My own wanderlust was cultivated at a young age. Although my family never took anything but road trips growing up, my father used to regale me with bedtime stories of Gee Gee Go-Go, a fictional character who traveled all over the world on his tricycle. It’s no surprise I became a Pan Am flight attendant! What research says travel can do for youI know, there are many reasons why the word “travel” doesn’t have the allure it once had: security, restrictions, frenzied airports and packed airplanes, to name a few. I also long for those glamorous days of travel. But although the journey may not always be as exciting as the destination these days, I still think that traveling — whether to places near or far — should be on the top of your list. 1. You’ll be healthier. The research is clear that travel makes us healthier, especially as we age. The Framingham Heart Study found that women who vacationed at least twice a year are healthier and much less prone to suffering a coronary event than those who vacation less frequently. A study sponsored by the National Heart, Lung and Blood Institute found that men with high risk for coronary heart disease who took frequent annual vacations were 21 percent less likely to die from any cause and 32 percent less likely to die from heart disease. A Global Coalition on Aging study also credits travel with helping to prevent dementia and Alzheimer’s, especially with retired people. This all makes sense when you think about how stimulating the act of traveling is for your brain. Travel requires you to make new decisions, learn new routes, read maps and adapt to new situations. New adventure means negotiating new paths. 2. You’ll be happier According to a Cornell University study, people can even experience a direct increase in happiness just from the act of planning a trip. I’ve seen this in action with my husband, who loves researching travel options and will spend hours on the computer, enjoying every minute of it. For most of us, having a change of scenery to look forward to, something that takes us away from the everyday routine and stresses of life and lightens the heart, boosts the spirit. Buying “experiences” brings more satisfaction than buying “things,” according to the Cornell study. 3. You’ll relieve stress. Traveling takes you away to another world far from your normal surroundings and alleviates stress by transforming your focus. Tourists walk through the famous Sagano Bamboo Forest in Kyoto, Japan.A study from the Marshfield Clinic in Wisconsin found that women who vacation at least twice a year are less likely to suffer from depression and chronic stress than women who vacation less than once every two years. The study also found that married women who vacation are more likely to be satisfied with their marriage. Other studies conclude that the stress reduction factor of traveling is a major contributor to longevity with men who are at high risk for coronary artery disease. 4. You’ll gain a sense of gratitude.It has been said, “It’s great to leave, and it’s great to come home.” One of the best effects of travel is the resulting increased gratitude and appreciation for what we generally take for granted. Whether you are vacationing on the French Riviera, touring rural India, visiting a national park or stopping by a town just a few hours away, these are experiences that enrich your view of the world around you. Being exposed to new surroundings and the diversity and beauty of our world leads to a greater sense of appreciation for life, and can be spiritually enlightening and gratifying. 5. You’ll make important memories. They say, “travel is the only thing you buy that makes you richer.” I think that’s true. Experiences made through traveling help create deep connections with others. Whether you travel alone, with a group or with family or friends, you will cherish these memories for a lifetime. 6. You’ll be more interesting. Immersing yourself in new places and cultures opens up your world to firsthand knowledge, more than you can learn from reading alone. The enriching experience of “being there” broadens your scope of understanding and makes you more interesting all around. You’ll never run out of cocktail party conversation! A vendor sell peanuts in Sri Lanka. Almost 150 years later, these words ring true now more than ever. The facts should be convincing; travel is good for us. Time to get packing! Travel expert Wendy Knecht is a former flight attendant, a designer of travel bags and author of Life, Love, and a Hijacking: My Pan Am Memoir. She blogs at WendySueKnecht.com/blog. FASHION AND TRAVEL, A GREAT COMBO! 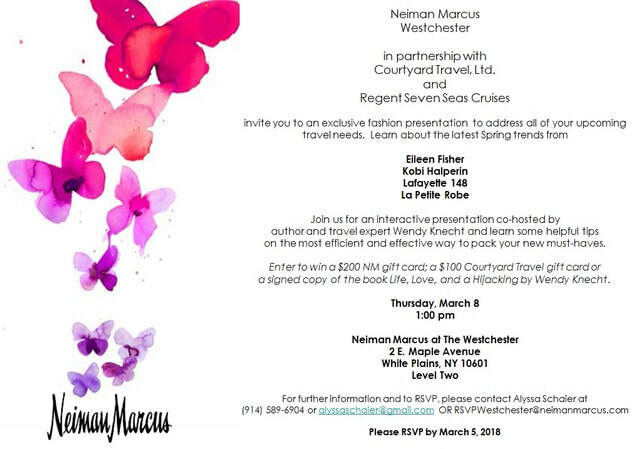 FUN WITH COURTYARD TRAVEL! 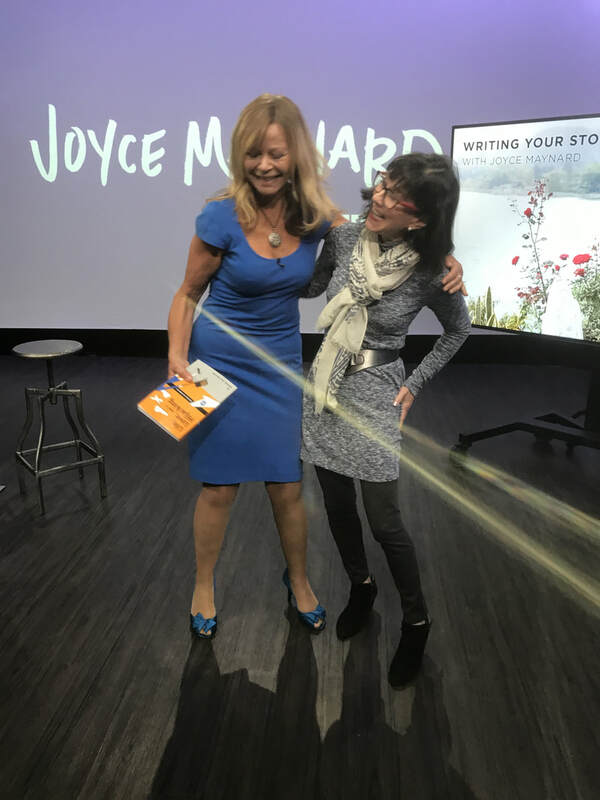 It was a treat to spend the day in San Francisco with the beloved author Joyce Maynard. I was so honored to be the luncheon speaker for the wonderful fundraising organization, Town and Gown. I spoke at their beautiful building at USC, and I could not have had a warmer reception. We had a great time, lots of laughs, and I loved talking about "the way we were," but also why we still have to keep traveling. Traveling is the best route to self-fulfulliment and understanding... and most of all discovery! 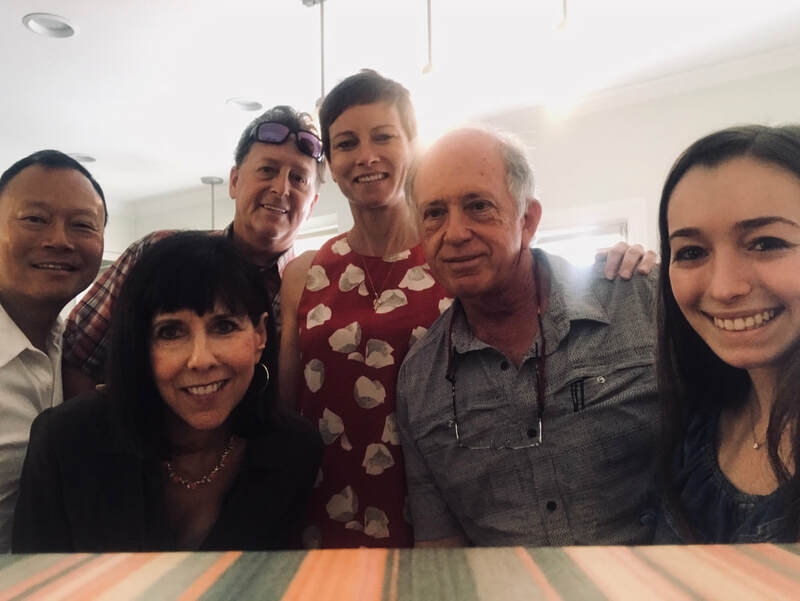 Lucky to have sister Kathy, and my dear friends and former Pan Am cohorts, Elle Feldman and the talented Philip Keene (of Major Crimes fame) in attendance. Thank you, ladies, for a truly memorable day! So proud to have this article about my beautiful mom, Ellie, in Next Avenue..... I am forever grateful to have had such a wonderful role model. Boomers share many common issues. If we are lucky enough to reach our 50s, 60s and beyond with one or both parents alive, caring for aging parents is likely to become one of those issues. Aging parents can be both a blessing and a heartbreak; as the children of them, we sometimes feel as if we are waiting for the other shoe to drop, even when our parents are healthy. And when the tables turn and you are the one taking care of your mom or dad, it can be a profoundly sad experience knowing that your parent is simply not going to get better. It is the rare instance that a broken hip or cancer doesn’t signal the beginning of a downward spiral. The Sadness of DeclineIn my case, it was a terribly difficult time when my mother got older. It was demoralizing to see her, a once vibrant woman who loved life, succumb to illness and confined to a wheelchair. She was truly a remarkable woman and loved life so much that she refused to take anything but the red-eye across country — up until the age of 87! She just didn’t want to “waste the day” traveling. Even with the sadness, I have to say it was truly an honor to be able to be there for my mother, and I consider it a blessing that we had time to say goodbye. I didn’t have the good fortune to have that experience with my dad, who died suddenly of a heart attack on my 17th birthday. Thinking back to this period of my mother’s decline, I realize it was the most stressful time of my life; the sleepless nights, the anxiety and jumping up when the phone rang. Recalling a Wonderful LifeBut one thing stands out as a time of joy and gratitude for both of us in those last few months: Tthe time we shared going through my many photo albums, both the physical ones and the ones on my laptop. I would bring them over to her nursing home, put on her favorite Frank Sinatra music in the background and watch her eyes light up as the music played and her sheer delight as we would go through the pages. We were able to relive the highlights of our lives together; it was a very special time. Having been a Pan Am flight attendant and single until my late 40s, I was lucky to have had some great travel time with my mother. We took full advantage of my travel benefits, which took us to many places around the world — Europe, Asia and South America among them. We reveled in reminiscing about these special times while looking at the travel photos. There were also pictures of family holidays, visits with her well-loved grandson and events and places that touched her life. Looking at all of these led to lively conversation and took us far from the nursing home walls. Even with the bit of dementia she had developed, the pictures and music brought us both to a level of happiness and a place of gratitude. We said a lot of “I love you so much” and “Didn’t we have fun?” To hear her say “I’ve had a wonderful life” was everything to me. Bringing out all those good memories was truly a celebration of her life. Grateful for Beautiful MemoriesIn sadness, there can be great beauty. I miss my mother like crazy, and I believe I always will. But I am forever grateful for these beautiful memories. When it comes right down to it, all we have is memories. You don’t have to travel or go far away to make memories. It doesn’t have to be a cruise or an exotic locale; it can be as simple as a Saturday matinee or a Sunday brunch. But make those memories, and take the time to reflect, laugh and document them. You’ll be so glad you did. September 5th marks the 30th anniversary of the hijacking of Pan Am Flight 73 in Karachi, Pakistan. Twenty people lost their lives that day when four armed terrorists from the Abu Nidal Organization stormed the plane and held passengers hostage for 17 hours, before letting off all of their ammunition in a hail of bullets and hand grenades. I disembarked from Flight 72 in Bombay, India, in the early morning hours of September 5th. As I exited the jetway I greeted the Indian crew, who were waiting eagerly to board Flight 73, on their way back to Karachi, and then scheduled on to Frankfurt. As a Pan Am flight attendant working on Special Assignment, I had been sent to Bombay in February of 1986 to train our new Indian foreign national flight attendants, a bright and beautiful group of individuals. Little did I ever anticipate they would be in harm's way a mere six months later, and would be responsible for the safety and security of 379 passengers during this incredibly frightening event. On this day, I was on my way back to India for a personal visit, and was so proud to see these wonderful new flight attendants brilliantly groomed and happy, and I gave them each a heartfelt hug before they boarded Flight 73. The hijacking ensued after the plane landed in Karachi, as it sat on the ground waiting to make final preparations to take off. The boarding door was still open, when terrorists, dressed as security guards, stormed the plane. After being tipped off by the Purser, Neerja Bhanot, the pilots fled the cockpit, in a sanctioned security move to effectively ground the aircraft. Though this action probably saved many lives, it left the newbie flight attendants, who had just completed their six months of probationary service, to defend the passenger’s safety. Their heroic acts saved many lives. Neerja Bhanot, chief Purser on Flight 73, lost her life that day, as she sheltered unaccompanied minors from harm. Neerja became a national hero, immortalized by her valiant deeds, and a Bollywood movie called "Neerja" released earlier this year. The movie reenacted the events that occurred on that day, and Neerja's heroism. She and her crew saved many passenger's lives by hiding American passports. When the shooting started and the hijacking came to a bloody end, the whole crew bravely protected the lives of others before their own, though Neerja sacrificed her own life in the process. I wrote a book called Life, Love, and a Hijacking: My Pan Am Memoir, which details my involvement with the events that day and what ensued in the aftermath of Flight 73 while I was in India. Today, people reminisce with awe about Pan Am, the carrier that literally launched international flights and was the trailblazer of the jet age. Those too young to have flown on Pan Am are intrigued by the prospect of what air travel on Pan Am used to be. Pan Am wearables, bags, flight trinkets and souvenirs are cherished, and are sought after items for young and old alike. Here in Los Angeles, we will commemorate the 30th anniversary of Pan Am Flight 73 with a private Indian dinner attended by ex- Pan Amers, friends, and family. We will be honored to have a passenger from the flight in attendance with her family. A fifteen-year-old unaccompanied minor at the time, she will give a presentation on her experiences and insights on that fateful day. We will honor Neerja Bhanot, the entire crew of Pan Am Flight 73, the passengers who lost their lives and those who forever have the terror of this event emblazoned on their heart. Terrorism may still exist today, but the heros of these monumental events of our nation’s history shall never be forgotten, and neither will Pan Am.